I’ve got to admit that I go through phases with Dream Theater. For my money sometimes they can get a little too technical, seeming to be more concerned with how many notes can be played in a given period of time than with a rocking groove, emotion packed lyrics and anything resembling melodic hooks. That kind of burns me out on the band and I shut them out. 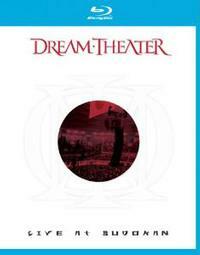 Well, after seeing this BluRay, I’m back in a “Dream Theater is awesome” state of mind. Everything here is great. They’ve taken all the great things from the DVD, which I’ve never owned, and upgraded them to BluRay. The video and audio quality are great and this was an awesome performance. It starts off a bit metallic (it was the Train of Thought tour), but they don’t stay there. Indeed, they make it into a real progressive rock tour de force. I’ve seen Dream Theater a few times, and this performance might be the best. I’d highly recommend this BluRay to any fans of metallic progressive rock. Certainly Dream Theater fanatics don’t need any encouragement to pick this up.